Production of recombinant monoclonal antibodies (mAbs) is important in the studying and development of novel antibody-based treatments for a number of diseases including cancer. DNA technology to express the mAb of interest. Mammalian cells (such as CHO cells) for their production, as they are capable of high-yield expression both as transient and stable cell lines. Affinity chromatography to purify the final mAb. Optimization of the expression vector before transfection into mammalian cells is indispensable in ensuring that the mAb production is sufficient and accurate. InvivoGen has carefully designed an extensive collection of plasmids to meet your mAb-producing needs. Our plasmid backbones have been optimized to ensure ideal expression under the control of composite promoters. In addition, our plasmids contain unique multiple cloning sites (MCSs) for the insertion of variable regions of any given mAb. Whether you want to change the effector function of your mAb or just want to maximize your mAb production, InvivoGen has the plasmid you need. 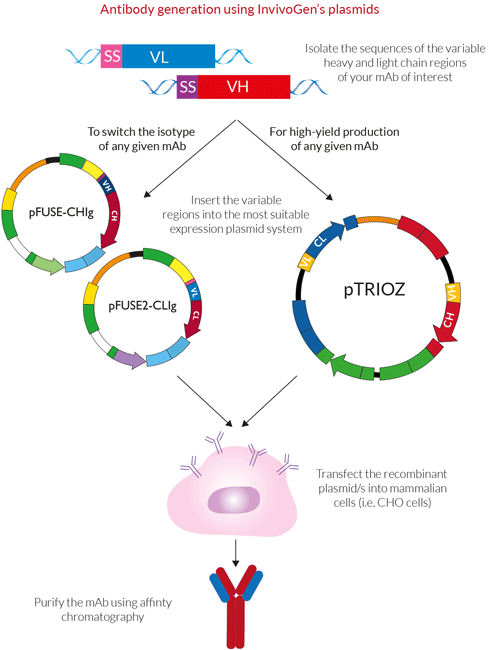 pFUSE: an exhaustive collection of plasmids designed to change a mAb from one isotype to another enabling the generation of mAbs with the same antigen affinity but different effector functions. 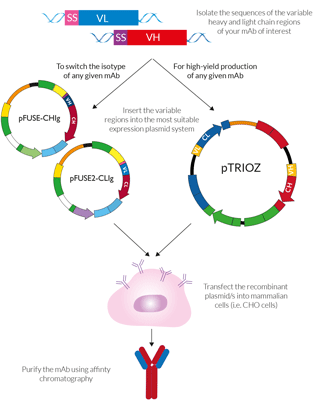 pTRIOZ: a collection of plasmids designed for high-yield whole mAb production using a single plasmid.